The Ponytail palm is a popular tropical plant great for both office plantscapes and as a houseplant. This unique plant is actually not a true palm. It is a member of the Lily family and native to the deserts of Mexico. It is sometimes called an Elephant’s foot due to its unique trunk which stores water. It is most often sold as a small table-top plant, either with a single plant or several smaller plants in a clump. Larger specimens up to 5 or 6 ft in height are available, but can be pricey due to it being a very slow growing plant. In its native environment it can reach heights of 15 ft with a base 6-7ft across! It is not unusual to find people who have had these plants for decades. They are extremely hardy when grown in the right conditions. The Ponytail plant requires very good light. They will survive if placed in a north or east window, but a south or west window is best. This tropical plant does well indoors in Canada. Because of their arid native habitat, they can tolerate the dry air indoors in winter better than many plants. Care of the Ponytail palm is straightforward. Water infrequently when the soil feels dry. Ensure it is planted in well drained, porous soil. 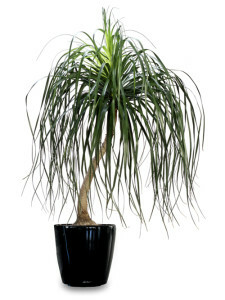 Do not allow water to accumulate in the bottom of the pot as this plant will rot quickly. It requires repotting into a larger container only when the base of the plant becomes too large. The Ponytail palm is resistant to most insects. It may get mealy bug in the winter if the air is very dry. Regular inspection and cleaning will keep this under control. Fertilize once per month in the spring, summer and fall.